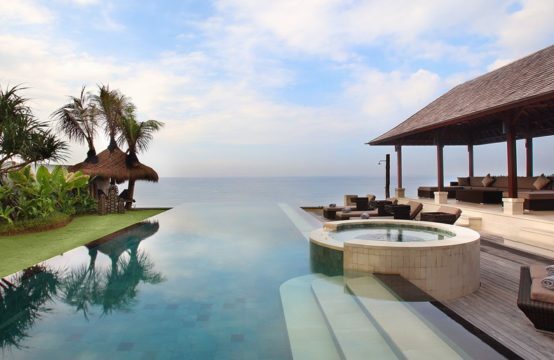 An extraordinary beachfront villa is exclusively part of Pantai Lima Estate. The villa presenting lovely lush palm-fringed tropical garden with magnificent ocean view. Instead of its beachfront setting, the guests also may enjoy its enchanting river and rice field views just next to it. Villa Mary is spaciously built, beautifully furnished and finished to ensure guests satisfying holiday. This most spacious villa in Pantai Lima Estate consists of five air-conditioned double bedrooms with king, queen, and prince-sized beds with en suite bathrooms. Also, each bedrooms has bath tub and exclusive view to the beach and spacious living areas. The facilities of the villa are 20 metre long pool, Massage Pavilion, Tennis & Gym, Internet & Phone, LCD television screen & Satellite TV programming (all rooms), 20 guests capacity home cinema with a High-Definition movie projection system, Internet & Phone, Staff & Security. Villa Mary is located at Pererenan Beach, a secluded beach on the west coast of Bali, between Canggu and Hindu temple, Tanah Lot that known as sunset temple. 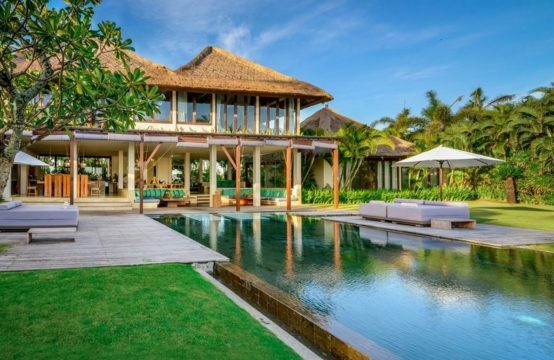 Villa Mary becoming symbol of peace in centre yet only 25 minutes driving into excitement of Seminyak; where guests may enjoy dining, shopping or strolling around it, 45 minutes drive from Tanah Lot and Nirwana golf course and only 45 minutes drive from the airport. The master bedroom is located on the ground floor with a view directly onto the pool and beach. The outdoor bath tub and spacious, yet private bathroom make this an extremely desirable bedroom. The sliding doors onto the pool make it extremely easy for you to step right into the pool or head directly to breakfast at the outdoor pavilion. The master bath includes an outdoor bathtub that is literally sunk into a Koi pond. The indoor part to the bathroom provides guests with generous facilities including double sinks, air conditioning and showers. Rooms with the best view; these two bedrooms are very generously proportioned with fabulous views onto the waves and the beach in front. In the winter months these will have a nice breeze flowing through the bedrooms.These bathrooms have separate stand-alone bathtubs as well as private shower areas and vanity areas with sinks. All bathrooms are made with top notch European fixtures and all soaps and shampoos are provided by Hermes. These downstairs bedrooms do not benefit from the same kind of sea views as the rest of the bedrooms; however they are more private in that they are separate stand-alone buildings that are about ten meters away from the structure of the main house. They also both benefit from outdoor as well as indoor showering facilities. Extreme care has been taken to ensure that every view into these rooms has been carefully shielded from the outside so no one can see into the private areas of the bathrooms. All bedrooms have their own 37 inch LCD television screen with satellite TV programming, DVD and Bose sound system. iPod docks throughout the villa are connected to speakers throughout the villa and the garden. You have a large 20 guests capacity home cinema with a High Definition movie projection system. The 50 square meter space can be thrown open with French windows and plays host to the finest cuisines in the world, from local Balinese fare to French, Italian or even Japanese, prepared for you by your own private chef and staff in the comfort of your air conditioned dining room. This breezy living room and lounge is open to the gentle sea breezes and caters to the most elegant of cocktail gatherings as it opens onto an oasis of fresh air, pool and ocean. It measures 100 square meters. There is also a second unenclosed living room on an upper level that has exceptional rice field views measuring 45 square meters. Nestled on the edge of where Villa Mary’s beautiful green lawn ends and the majestic beach and ocean begins is the lovely massage pavilion. Drift off to the cathartic sounds of the waves crashing against the shore as you enjoy any number of ?spa treatments from a massage to manicure. Just ask your butler to arrange for a massage or beauty therapist to visit. Villa Mary comprises two pools: One adult pool, perfect for relaxing and fitness measuring 20 meters, and another 10 square meter shallow pool for toddlers and infants. Both pools are chlorine free and kid friendly. A heated Jacuzzi near the beach-front also holds up to six adults. Villa Mary has a tennis court with an all weather surface and night lighting for all guests to enjoy. A selection of fitness equipment is also available should you want something more strenuous than long beach walks to keep in shape.Villa Mary has a tennis court with an all weather surface and night lighting for all guests to enjoy. A selection of fitness equipment is also available should you want something more strenuous than long beach walks to keep in shape.